Special Containment Procedures: SCP-1541 is to be kept in a wooden frame, covered with a cloth, and stored in a 5m x 5m x 5m passcode-secured room. Research authorization from Level 4 staff is required for access. Description: SCP-1541 is a painting by the Italian painter Moretto da Brescia, entitled Virgin and Saint Elizabeth with the Holy Children Appearing to Two Camaldolese Friars, dating from the mid-16th century. It is an oil painting on canvas, measuring 265 x 186 cm, and currently contained within an unremarkable wooden frame. In the early twentieth century the painting was obtained by the Kaiser-Friedrich-Museum (now the Bode Museum) in Berlin, and exhibited as part of the collection with no reports of anomalous effects. During World War II, it was stored in the Friedrichshain Flakturm (anti-aircraft tower) for safekeeping, but the tower was destroyed in by Allied bombers in early 1945 and all paintings inside were presumed lost. Four decades later, the painting came to the attention of West German police, and subsequently the Foundation, when its anomalous effects became evident upon its attempted sale by a young accountant, H███████ M█████, who claimed that it had hung on the wall of his recently deceased mother's home for as long as he could remember. (See Addendum 1541-1 for further information from M█████.) A variety of chemical tests and stylistic markers indicate that the object in question does date from the 16th century, and small tears and discolorations in the painting have been matched with records from the Kaiser-Friedrich-Museum regarding the Moretto painting. 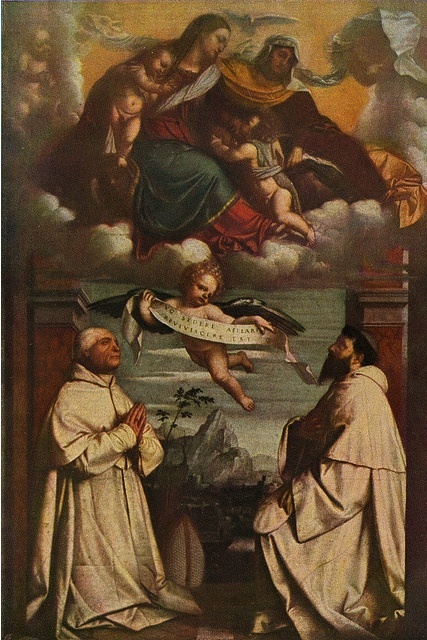 Given the unlikelihood of a high-quality forgery of the work of a relatively minor artist, as well as SCP-1541's demonstrated resistance to fire, it seems probably that Moretto's Virgin and Saint Elizabeth did survive the 1945 fire, but obtained its peculiar characteristics at a later date.